SEGGER introduces J-Trace PRO Cortex, the new flagship J-Trace streaming trace probe model, capable of supporting streaming trace from Cortex-A, Cortex-R, and Cortex-M targets. In addition to the Gigabit Ethernet interface, it now comes with a USB 3 SuperSpeed interface which is capable of transferring trace data in real time to the host even at full trace clock speeds. The host software is able to store, analyze and visualize the data in real time over unlimited periods of time, supporting the full bandwidth of the target interface of up to 1.2 GBit/s. 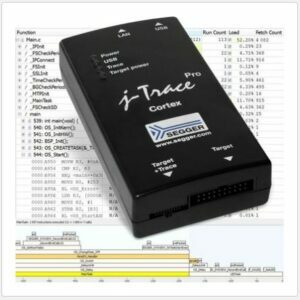 J-Trace PRO Cortex uses Ozone, the fully featured graphical debug and performance analyzer for embedded applications. Ozone is an advanced professional debug and verification application, that can use ELF files produced by any EABI-compliant tool such as SEGGER Embedded Studio, Eclipse/GCC, IAR Embedded Workbench or Keil/ARM MDK, to debug and analyze at the source level. Ozone provides real-time code profiling and real-time code coverage in combination with the streaming trace technology of the J-Trace PRO Cortex. It takes less than 15 minutes to get up running with the new trace probe, as it ships with a Cortex-M target hardware, with ELF file and project for Embedded Studio readily available. ”Debugging and verification tools have progressed significantly in the past couple of years. We believe that the combination of Ozone and J-Trace PRO is the best trace solution in the industry. Code profiling of a running system provides instant, accurate performance measurements rather than the optimistic ’ideal’ results from a simulated environment. With J-Trace and Ozone such systems are quick to set up and define the user experience: It simply works!” says Alex Gruener, CTO at SEGGER Microcontroller.